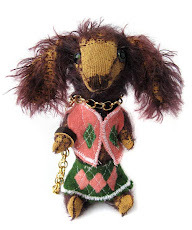 Let me begin the tour with ye olde feedsack rag ball~ ahh, pray tell what mysteries lie inside it! 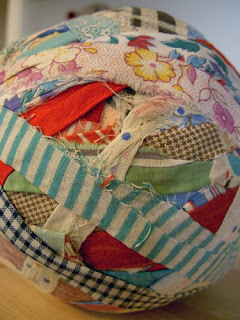 I bought this great-looking solid rag ball for it's fabulous synergy~ i couldn't resist the fascinating wound layers and the mind-boggling array of colorful feedsacks in this self-contained "material world" (pardon the pun). Temptation got the best of me and I did unwind a few lengths to grace the necks of some teddy bears. 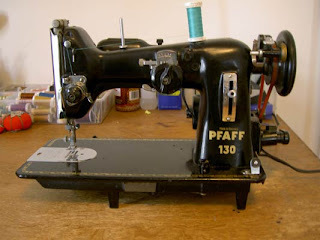 The hardest working gal in "sew" biz: the Pfaff 130! The most important appliance in the house, next to the Bodum French Press :O) A 1950's semi-industrial workhorse, the Pfaff has been my 'old faithful' since the beginning. 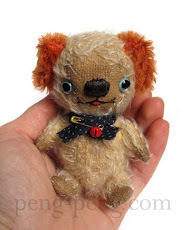 Gotta give props to lovely Deb Beardsley (Beardsley Bears) who recommended the Pfaff when i was a fledging hand sewer (with cramping fingers) looking for a sewing machine. I tend to believe old things were made so much better. 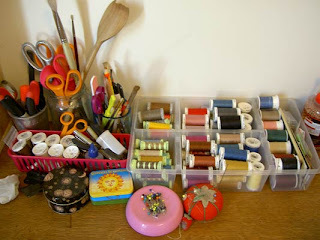 Another hardworking part of the team: my sewing table. It is solid oak and originally used as a school table long ago~ there was petrified chewing gum underneath the tabletop to prove it! It is taking a beating from the heavy Pfaff, which I constantly push towards and away while toggling between machine sewing and handiwork. Athough the table is 72" long, I only work in the small area in front of the machine, under the task lamp. One can never have enough thread, oui? Though there always is that *one color* you just don't have and must run to the store, like vivid lemon yellow or pastel purple. 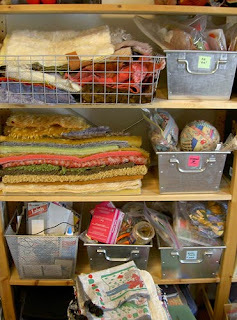 Neatly folded mohair and organized (albeit overflowing) supply bins.. (wait, is this really MY studio?? lol!) It is infrequent that i can even see the floor, but sometimes it's good to find out if a floor is still there! 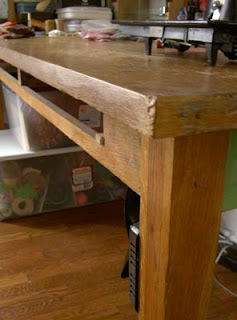 Under the sewing table is where all the pom poms are born (and dust bunnies too, but we won't discuss that right now). 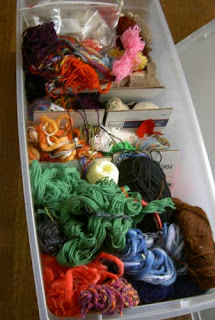 A giant tub of yarn, yarn, and more yarn... All kinds; wool, cotton, acrylic, variegated, blends. I made cardboard dividers from flattened boxes, but keeping the yarn untangled and in their proper 'zones' proved impossible. With this abundance of yarns, i have thought about learning to knit, though i've yet to crack open my copy of "Knitter's Handbook". 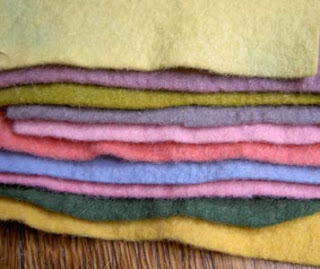 Delightful, hand dyed assorti of wool felt. Most are dyed on white wool, and others dyed colored wool (the neat lime-olive shade, 3rd from top, was a 'happy accident'.. sometimes the outcome is unpredictable, but we like unpredictable). Some examples from my vintage ric rac stash. 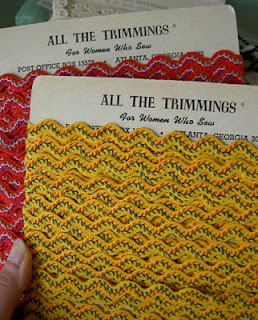 All the Trimmings "for women who sew". 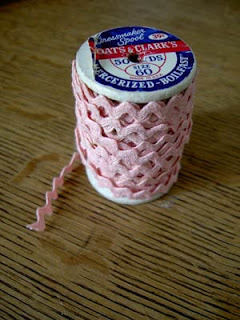 Sweet little spool of baby pink ric rac. 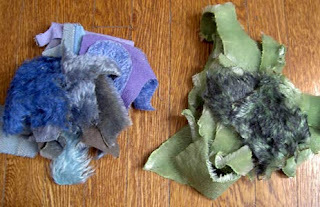 Over time, I accumulate lots of little odd shaped mohair scraps, so I group them by color in ziploc bags. 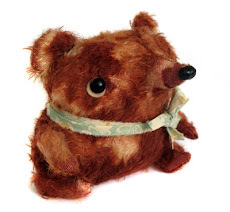 This way it is a lot easier to find what you need for that certain bear or project. Big tin of old buttons. Warning: do not attempt to count! 2nd Warning: do not attempt to organize! Ever hear the saying "It takes fifty gallons of sap to make just one gallon of maple syrup"? This is what goes through my head as I sift through hundreds and hundreds of old buttons, looking for the special few who will be worthy enough for the prestigious position of sock monkey eyes (see small pile of dark buttons to the right of photo). 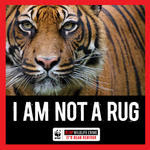 I've learned a lot since then, and have grown into my own style using fabrics that I buy with my own money! And that leaves me with a closet full of wearable clothes, which is a plus. 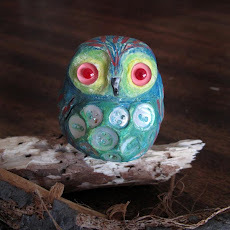 I just wanted to say, that even though I feel that the possibility of me making a living doing what I love (making friendly creatures) is slim, I feel good at least knowing that someone as creative as yourself has found a way to do it! 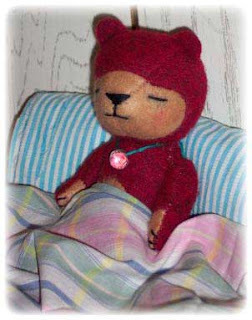 I have attached a photo of one of my creations, "Little Zen bear" lol. I just can't seem to get him to stop meditating! Thank u Katie! 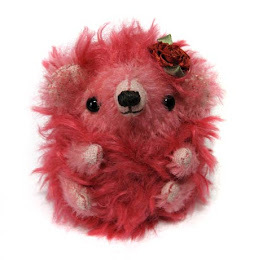 your Zen bear is adorable ;O) Keep following your heart! 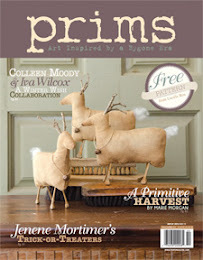 ~~Do you have an inspiring tale to share? Feel free to post it here or email your story to me, i'd love to hear from ya! 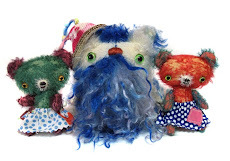 New Sock Monkeys n' Ellies Update Announcement! 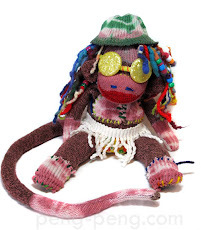 The long-awaited Sock Monkey listing is happening on my web site, Wednesday May 14 @ 12 noon Central (10am Pacific/ 11am Mountain/ 1pm Eastern). 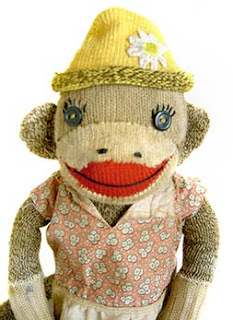 Be sure to 'refresh' your browser at that time to see the new Sock Monkeys & Sock Elephants all dressed up for spring! 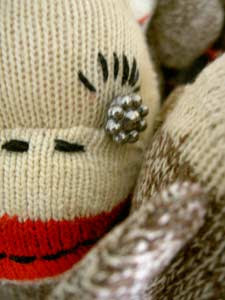 My studio is alive with sock monkey madness! It's been *eons* since my last sock monkey update (September 2007 to be exact) so it's high time for some more! There will be a few sock elephants as well. Stay tuned for date/ time announcement, and be sure you're on my private mailing list to be the first to know about when i post new creations.